Rose Justice is an American ATA pilot who spends her days ferrying planes to troops across Britain and composing poetry, not quite believing what she thinks is anti-German propaganda about the horrors of occupied Europe. When she is captured by German forces and sent to Ravensbruck, a notorious women’s concentration camp, she discovers that the rumors about prisoner treatment are not only true, but mild compared to the reality she faces. Rose cannot simply just endure her imprisonment, but she must find a way to fight back if she and her new friends are to survive. Like she did with Code Name Verity, Wein tells Rose’s harrowing story through journals, letters, and other written accounts. The novel begins when Rose starts her journal, detailing her day-to-day tasks as an auxiliary pilot and abruptly stops when she is captured, only to begin again months later when she has been rescued. Rose’s narrative is interjected with letters from friends and her own beautiful and heartbreaking poetry. Oftentimes with epistolary novels readers must suspend a certain amount of disbelief at how the story unfolds, yet Wein manages to build beautiful characters through Rose’s impassioned memories of her friends, she creates tension and suspense as Rose struggles to put her story to paper after her escape, and above all she tells a magnificent story that makes you forget that you are not reading primary documents. 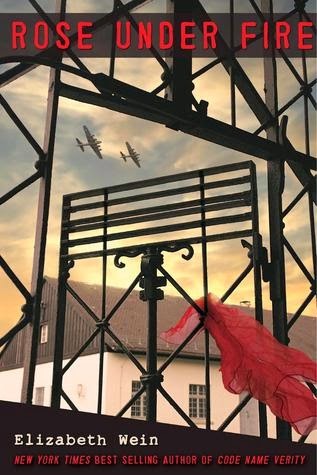 Wein’s unconventional choices regarding narrative and viewpoint pay off in big ways as they not only tell a story of survival, but address the difficulties the concentration camp survivors faced after the war in telling their stories, obtaining justice, and learning to live again. Do not miss this book. Cover Comments: This cover is pretty in a foreboding way. I love that it has a glimpse of the sky and the airplanes, as that is actually significant to the story. Book received as a gift! This is Elizabeth Wein's second book about young women in WW II. While not quite the multi-layered masterpiece that she gave us in Code Name Verity, this is still a gripping adventure story as well as a sobering look into the awful reality of the Ravensbruck women's concentration camp. Highly recommended.